Figure 1. The Forget-Me-Not™ EvaGreen® Master Mix (2-color tracking) containing a light blue dye before (left) and after (right) addition of template containing the dark blue template buffer. Our Forget-Me-Not™ EvaGreen® qPCR Master Mixes are hot-start EvaGreen® dye-based master mixes for use in real-time PCR applications and DNA melt curve analysis. These master mixes can be used in place of any SYBR® Green dye-based master mixes. The Forget-Me-Not™ EvaGreen® qPCR Master Mixes contain a low concentration of inert blue dye allowing you to easily see the wells that contain master mix. The master mixes are available without ROX passive dye, with a separate tube of ROX, or premixed with ROX (high or low concentrations). A kit is available with a 2-color tracking system that includes DNA template buffer (a dark blue dye) which when mixed with the template, will change your reaction from light to dark blue when template is added (Figure 1, left). The 2-color tracking system can prevent pipetting mistakes and avoid wasting time, reagents, and precious DNA samples. Figure 2. Forget-Me-Not™ EvaGreen® qPCR master mix performs as well or better than other dye-based PCR master mixes, with exceptional brightness and sensitivity. A unique DNA-binding dye with features ideal for both qPCR and High Resolution Melting® (HRM) analysis*. EvaGreen® dye binds to dsDNA via a novel “release-on-demand” mechanism, which permits the use of a relatively high dye concentration in qPCR without PCR inhibition (Mao, et al. 2007. BMC Biotech. 7, 76-91). Click here for more information about EvaGreen® dye. A unique feature of EvaGreen® dye is its safety. DNA-binding dyes are inherently dangerous due to their potential to cause mutation. With this in mind, Biotium’s scientists designed EvaGreen® dye such that it cannot cross cell membranes, thus preventing the dye from being in contact with genomic DNA in live cells. All other commercial PCR dyes enter into cells in a matter of minutes. SYBR® Green I, for example, has been shown to be environmentally more toxic than ethidium bromide, a well-known mutagen (Ohta, et al. 2001. Mut. Res. 492, 91-97). Independent labs have confirmed that EvaGreen dye is nonmutagenic, noncytotoxic and safe to aquatic life for direct disposal in the drain. For details, download the EvaGreen® Dye Safety Report. An added benefit of an EvaGreen®-based master mix is that you can analyze your PCR product by gel electrophoresis without the need to add another DNA-binding dye to either your loading buffer or gel. The EvaGreen® dye in the master mix can act as a DNA pre-stain, permitting direct visualization of DNA bands following electrophoresis. Cheetah™ HotStart Taq DNA Polymerase is Biotium’s proprietary chemically-modified hot-start DNA Polymerase. Cheetah™ Taq is completely inactive at room temperature, and is fully activated after 2 minutes at 95°C, making it particularly suitable for fast cycling PCR protocols. 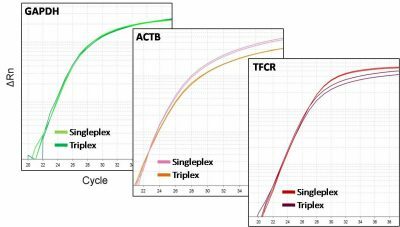 Forget-Me-Not™ Universal Probe qPCR Master Mix is a high-performance product for fluorescent probe-based PCR applications, including quantitation and SNP genotyping. This kit is suitable for all fluorescent probe-based technologies, including hydrolysis probes (such as TaqMan® and dual-labeled BHQ® probes) and displacement probes (like Molecular Beacons). 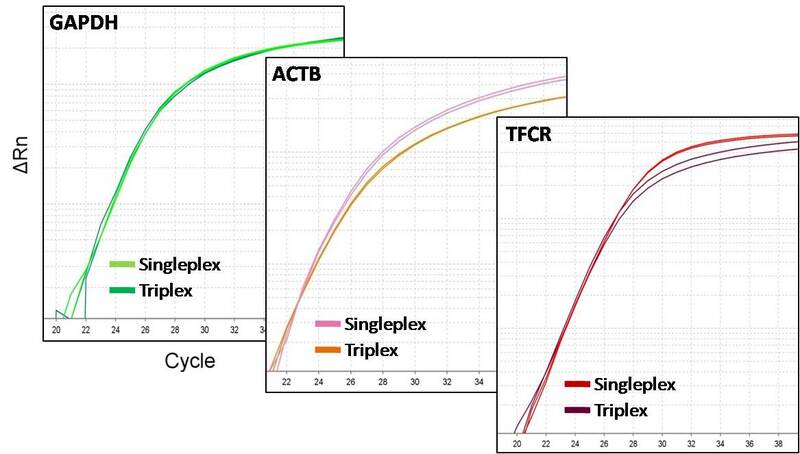 Forget-Me-Not™ Universal Probe qPCR Master Mix shows excellent concordance of results in singleplex and multiplex reactions, has broad instrument compatibility, and can be used in both standard and fast protocols. A separate kit is also available with ROX, if your instrument requires ROX reference dye. 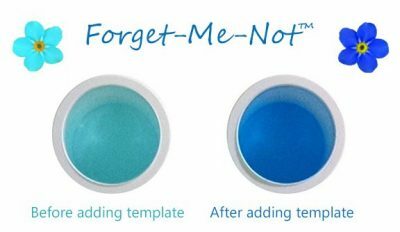 The kit includes 40X Forget-Me-Not™ Tracking Buffer which contains an inert blue dye. You have the choice of adding Tacking Buffer to the master mix, to the DNA template, or not to use the tracking buffer in your reactions. Addition of Tracking Buffer to your master mix allows you to easily distinguish wells containing reaction mix from empty wells. On the other hand, adding Tracking Buffer to your DNA template samples allows you to track which reactions have had template added while you set up your PCR reactions. Figure 3. Forget-Me-Not Universal Probe Master Mix works exceptionally well for mutiplexed probe PCR reactions. EvaGreen® Dye and Cheetah™ HotStart Taq DNA Polymerase are covered under US and international patents. QuantiNova is a registered trademark of Qiagen Group. SYBR is a registered trademark of Molecular Probes, Inc./Life Technologies. *HRM is a registered trademark of Idaho Technologies, Inc./BioFire Defense, LLC and its use may require a license.